I grew up on the music of Pete Seeger. Indeed, given that my parents named me after Woody Guthrie, a familiarity with Pete Seeger’s work was probably inevitable. His death this week, at a vigorous 94, was hardly a surprise, but is still a shock and a tragic loss. Seeger was, by his own admission, not a tremendous songwriter. His favorite of his own compositions was "Turn! Turn! Turn! (to Everything There Is a Season)", which he liked to quip just required him to set music to the poetry Ecclesiastes wrote a few centuries BCE. Nor was his singing voice so impressive by the time I started attending his concerts (Thanksgiving concerts with Arlo Guthrie at Carnegie Hall, Clearwater Festivals by his beloved Hudson River near his home in New York). He added, “in recent times, one of the purposes of my own singing is to persuade other people to sing together. It is fun to sing together. It is fun to learn how to harmonize. It is fun to learn how to play with the rhythm.” He knew enough to borrow what he could from the best of tradition, make it his own, and then make a gift of it to the audience. You can’t force people to sing along (in harmony no less! ), but you can make it so fun and so easy to join in that pretty soon you’ve got crowds of hundreds, thousands, even tens of thousands singing along, inventing their own harmonies and making the song their own. You could teach a class in political organizing just based on how he worked a crowd (little wonder, given the time Seeger spent at the forefront of the great social movements of the 20th century). Political organizers succeed by being generous in the same way: not by forcing anyone to join in, but by finding ways to make the work too much fun to pass up, and without letting ownership and ego overwhelm the need to work together and succeed. Nowadays, Seeger doesn't play before large audiences, partly because he fears his voice is no longer strong enough. But he'll spend hours in the club, mischievously giving out bumper stickers reading "Gravity — it's just a theory" and encouraging people to send them to anyone in Kansas, heartland of the anti-Darwinism, creationist movement. Attached is an interesting picture. It is actually a picture of a picture. It shows a picture of Pete holding up his bumper sticker. That picture is framed with an actual bumper sticker beneath it. 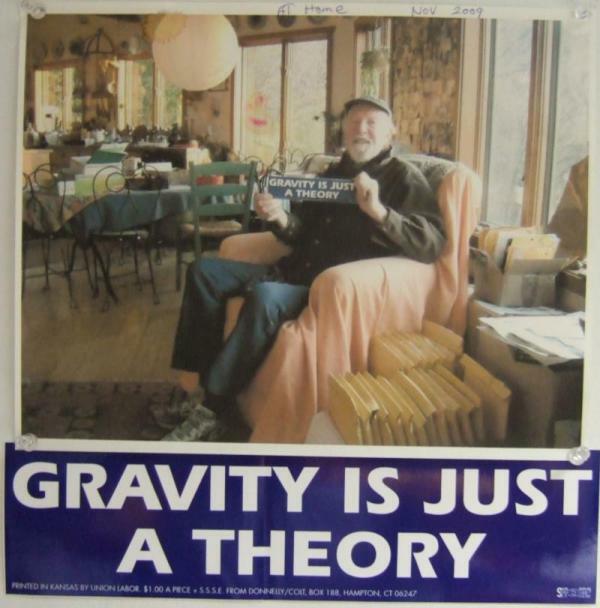 In a phone conversation with me, Mr. Seeger commented on how he had these b-stickers made when he heard about Kansas' trouble with evolution challenges to our science standards in 1999. He had heard about the creationist mantra that evolution was just a theory, thus the selection of the saying for the bumper sticker. He shared how he used to give them away at his concerts explaining how everyone needed to support strong science. When he was no longer giving many concerts, he contacted me, as KCFS president, to see if we wanted the stickers he had left. That was the first time we learned about what he had done and was doing to support strong science standards. It was only after we received he stickers that I saw that they had been printed by union labor in Kansas. Though I had no correspondence with Mr. Seeger on this, it is consistent with his support of unions that he used union labor in Kansas. That he printed them in Kansas we interpreted as ultimate support for the work we were doing on the standards issue. I cherish my contact with Mr. Seeger. Before all arrangements were completed I had enjoyed a 30-minute phone conversation with him (he called me and that was a surprise), had received two postcards from Pete, and he sent me a letter and a copy of his book on the history of folk song in America. We have one of those bumper stickers hanging in the NCSE office, too. It’s a small part of the grand legacy Pete Seeger left us all, as a nation, as activists, and as fans of this old brown earth. And with that, I’ll share a song that’s been running through my head ever since I heard that Pete Seeger had gone far away.